Youlgrave Parish Council has installed four defibrillators around the village for use by the public on victims of sudden cardiac arrest (heart attacks). IMPORTANT: In the event of an emergency dial 999 and ask for an ambulance before you do anything else. The operator will confirm the location of the nearest defibrillator and give you the number code to unlock the door of the defibrillator cabinet and access the equipment. On the exterior of the Farmyard Inn, Coldwell End, at the top end of the village. On the outside wall of Youlgrave Garage, Alport Lane, near the church in the centre of the village. On the outside of a private house at 25 Mawstone Lane, near the dale bottom by the River Bradford. 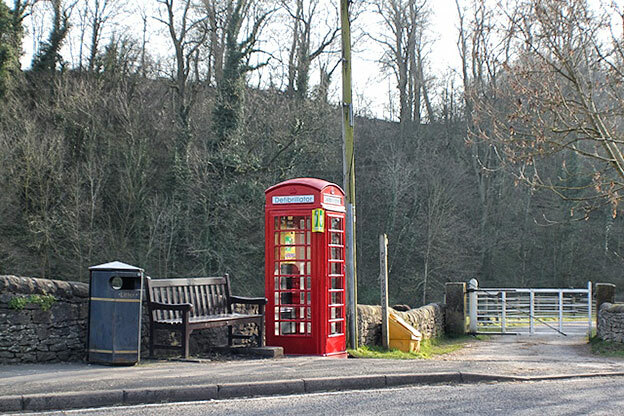 In the former red telephone box at Alport (within Youlgrave parish and owned by the Parish Council). Paint to spruce up the box was donated by a British Coatings Federation member and BT are supplying the power to the light and unit in support of the Community Heartbeat Trust. In addition, there is a defibrillator located inside Youlgrave Village Hall on Holywell Lane for users of the hall (this unit belongs to the Village Hall). What are they? A defibrillator is a potentially life-saving device which delivers an electrical current that shocks the heart back into a normal rhythm following a sudden cardiac arrest. They are safe and easy to use. The units cost up to £2,000 each and are wall-mounted in bright yellow metal boxes. Why are they there? 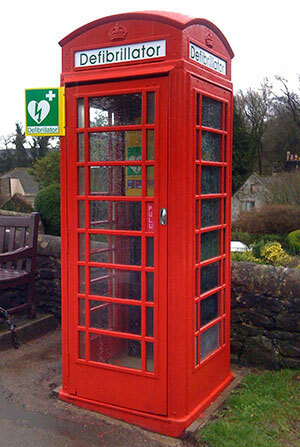 They have been installed around the village by the Parish Council amid concerns that ambulance response times for rural locations like Youlgrave can sometimes be lengthy, and are possibly set to get longer following likely ambulance service reorganisation. The Parish Council decided that the community needed to help itself and so it launched a fundraising drive. Who supplied the units? The Parish Council has teamed up with a national charity, the Community HeartBeat Trust, which already supplies defibrillators to parish councils and local groups elsewhere in the country, but until now had not worked with any in the Peak District. 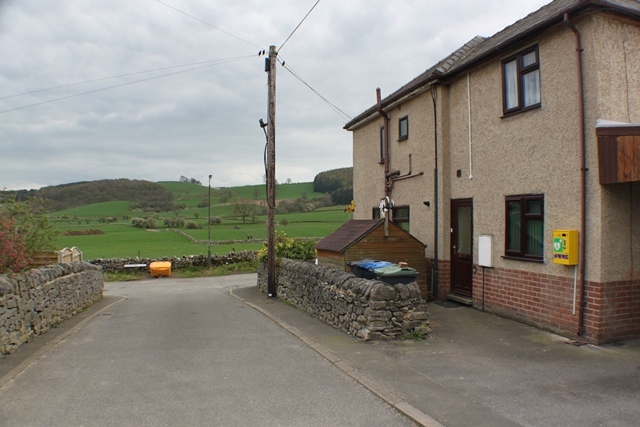 The Trust supplies all the equipment and provides training and advice, but the Parish Council installs and owns the units on behalf of the village and is responsible for their maintenance and upkeep. The equipment has to be regularly checked and replaced as necessary. Why the different locations? 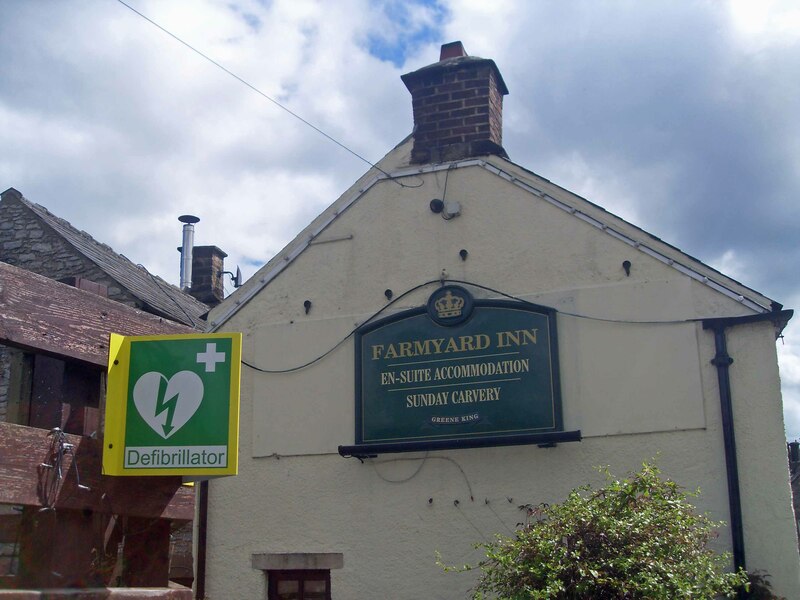 The four defibrillators are positioned at key locations around Youlgrave, ensuring that no resident should be any more than a few minutes away from potentially life-saving assistance. 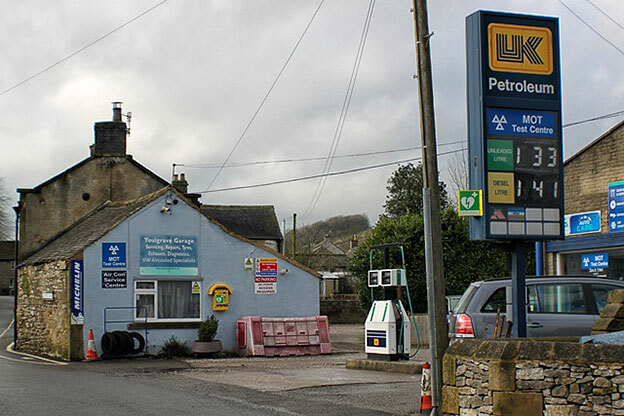 Youlgrave is also a popular destination for visitors, especially walkers on the Limestone Way and those exploring Bradford and Lathkill Dales, so the ‘defibs’ could potentially benefit a much larger number of people. What else is being done? Youlgrave Parish Council has arranged free ‘awareness training’ sessions for residents, run by the Community HeartBeat Trust, to show local people how to use the equipment and what to do in an emergency. The Parish Council hopes that this will lead to more formal first aid training for residents and already one qualified local person has come forward to volunteer to run them. Who will pay for them in future? Since the Parish Council is responsible for the ongoing costs of maintenance and replacement of the four units, which was considerably more than first envisaged, it welcomes donations to meet future costs. A ring-fenced fund has been set up, which will also cover additional costs of training and publicity. If you would like to make a contribution please contact Matthew Lovell, Youlgrave Parish Clerk, via the Contact Youlgrave Parish Council form or call 01629 636151. Alternatively, please send a cheque made payable to Youlgrave Parish Council to Christmas Cottage, Church Street, Youlgrave, Derbyshire DE45 1WL. For more information: To contact the Community HeartBeat Trust (reg charity no 1132824) call Martin Fagan on 0845 86 277 39 or email secretary@communityheartbeat.org.uk. Also see www.communityheartbeat.org.uk.